Swans Yacht Sales is in it's fourth decade of making sailing dreams come true. 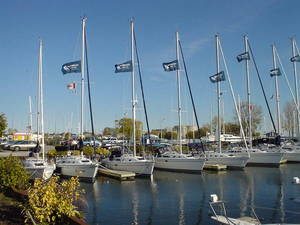 We have an extensive inventory of both new and used vessels to suit every sailing need and budget. We are certified dealers for Catalina and Dufour Yachts. Whatever your sailing dream, we make it so easy ! We'll help you find "that" boat, outfit it just right, and share your excitment as you free the docklines. Let us help you get those upgrades & maintenance issues done before your summer adventures ! Our service centre in Whitby will make it so easy - we have the pros to do electronic installations, maintenance, rigging work, engine tune ups, fibreglass & carpentry. Contact us now and start planning your summer sailing. We have been representing the Perrennial Award Winning Catalina line of yachts for over 30 years and are now also dealers for the exquisite Dufour Yachts. Whether you are looking for a dinghy, cottage boat, lake cruiser or offshore yacht, we will find the boat for you! Our full service centre (866-590-9208) at the Port Whitby Marina is an indoor facility offering a full range of services including heated indoor storage for the winter, commissioning, electronics installation & troubleshooting, rigging, fiberglass and engine repair, and custom woodwork. In addition serving you from our head sales office in Whitby, Ontario (866-628-3881) we can meet your boat purchasing needs from our sales offices in Wilson, New York (716-751-6877), Montreal, Quebec (514-347-7661), or Chester, Nova Scotia (866-628-3881).